・All incidental businesses relating to the preceding items. ※Please contact us by e-mail as much as you can, because staff is away from the office temporary. Toshi made his dream come true. When he was little kid, he started skiing in Sapporo and into skiing so deep. And little Toshi said "I wanna be a ski instructor when I grow up, and live in ski resort and ski everyday". 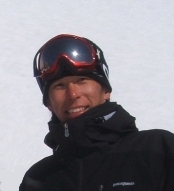 After grow up, he took a instructor lisence in Canada, and worked at ski schools in Canada and NZ. After spending seasons abroad, he had realised that "Niseko is the best place to ski in the world!" Since he came back to home country, spending his whole time in Niseko. He's been enjoying life in Niseko over 10 years now. © 2006-2015 Niseko Global Ski Academy. All rights reserved.